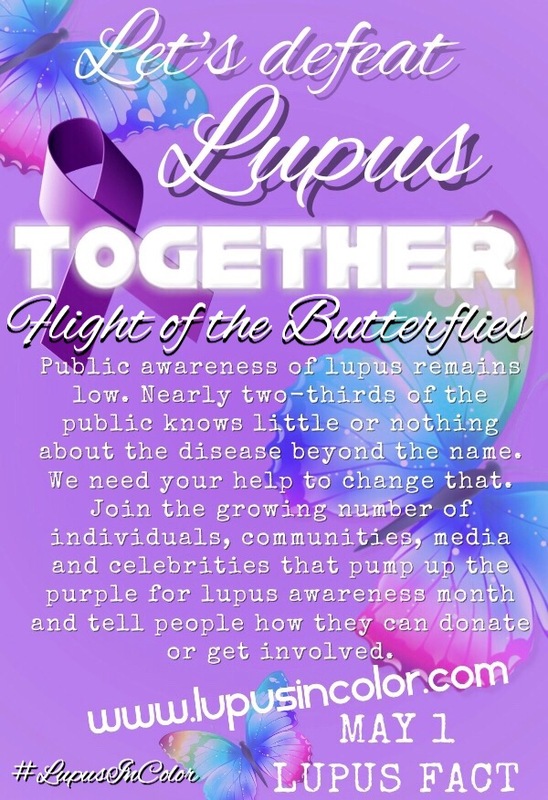 POSITIVE HOPE TO LUPUS WARRIORS ONE BUTTERFLY AT A TIME! Let this butterfly flutter all over cyberspace! Public awareness of lupus remains low. Nearly two-thirds of the public knows little or nothing about the disease beyond the name. We need your help to change that. Join the growing number of individuals, communities, media and celebrities that pump up the purple for lupus awareness month and tell people how they can donate or get involved. This is first Butterfly of Hope. We need awareness! We need a cure! Encourage everyone you know to let it FLY! The research, information and/or answers provided on this site are not meant to be used as a substitute for Professional Medical advice. Information is gathered from several sources via the internet, print and interviews with doctors and professionals and may differ from your physician’s advice. The information provided and presented is for educational purposes, to support visitors in the quest to learn more about a most silent disease. Being a lupus warrior can be a lonely and misunderstood disease and we want to help those affected to lessen those feelings. It is recommended before attempting to change anything in your medical or health regimen that you first check with your personal physician to see if it is appropriate for you and works with your medical treatment plan.